Brett Younger, associate professor of preaching at the McAfee School of Theology in Atlanta, tries to be funny while insulting Calvinists. Those whose knowledge of John Calvin is limited to predestination and Servetus might get a chuckle out of it. What about the Calvinist antimission movement? Please. Don't comment on Calvinism if you have no idea what it is. A professing Christian husband married to a Jewish wife writes, "God chose corporate, national Israel, not each individual Israelites (sic). ... I can't seem to find a way to pry the Jewish people or even one single, individual Jewish person out of the covenant promises that started with Abraham, continued into Sinai, and that were renewed for the future in Jeremiah 31 and Ezekiel 36." 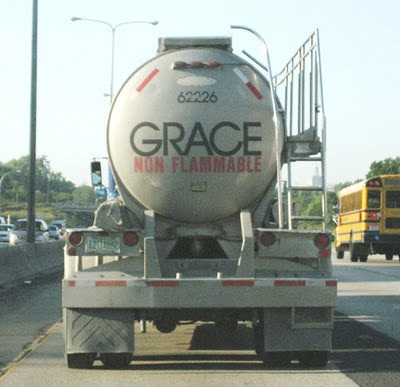 Um...Romans 9? Activists like these do not seek tolerance. They want nothing less than complete acceptance of their lifestyle as well as the elimination of any and all dissenting opinions. Is Molinism as depressing as Calvinism? "No," says William Lane Craig. Julie Anne thinks that "Patriarchy is complementarianism PLUS more, just as Neo Calvinism is Calvinism PLUS more." Many people say it is unfair for God to save some and not others. While Jason Dulle believes "there are formidable theological, exegetical, and philosophical problems with Calvinism," he has "come to think that the 'fairness' objection is not a good argument against Calvinism." A friend asks you to pass out evangelistic tracts with an anti-Calvinist message, saying, "Let's go save some Calvinists!" What would you do? Bob Hadley says, "Calvinism teaches that the gospel has NO POWER to save the unregenerate. ... So just like Lazarus who was dead, the gospel has no power to save or give new life in the calvinist (sic) system." I always thought the concept that the God who ordains the end also ordains the means was pretty straightforward. I guess not. Tim Keller and John Piper discuss C. S. Lewis. What is the devotional impact of limited atonement? Richard Phillips writes, "We praise God that we are not required to earn what Christ has done for us, for we never could do so. We receive His death by simple faith alone. Jesus never demands that we earn what He did for us." A video has been posted of the SBC 2013 Calvinism Advisory Panel. In a recent interview regarding his position on eternal security, Scot McKnight says, "If some want to counter my views, fine, but the only thing that interests me is if they can show that the audience [of Hebrews] is not genuine believers. If they can, I'll listen but if they want to show how they can explain the text as Calvinists...well, been there and done that." While many evangelicals and Catholics have found common ground, Calvinism continues to divide Protestants. There is a new course on Calvinism from John Piper. You can download the entire seminar in six parts.